Twice a year I make a pilgrimage to the Basilica in Mexico City to visit what is probably the most visited and revered spiritual site of the Americas. A little about the Basilica, which I affectionately call Spiritual Disneyland. 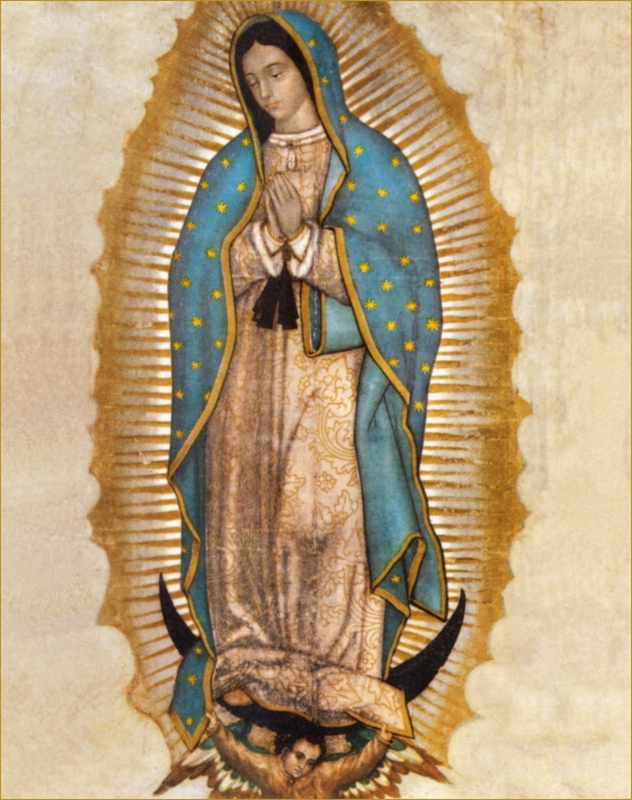 The story goes that in 1531 a representation of the divine mother appeared before Juan Diego, a peasant who was walking on a hill which was once in the middle of nowhere. This same remote site where the Virgin of Guadalupe appeared and asked Juan Diego for a favor is now surrounded by Mexico City, the largest city in the world. So here I am, at what in Egypt they would call the holy of holies — the most precious, powerful place of the Basilica, where the image of the Virgin of Guadalupe from the original tilma of Juan Diego is framed in gold high up on a wall. There are four moving sidewalks in front of the tilma, always filled with people crying, taking photos, praying, holding babies up to be blessed. One escalator goes one direction, the other three the other. So you can ride one moving sidewalk one direction and then turn around and ride one back to lengthen your stay in front of the Virgin of Guadalupe’s sacred image. People also crowd at either end of the moving sidewalks, drinking in the energy of the image, crying, taking photos, praying, and holding up babies to be blessed. It is humanity at our best: reverent, deeply moved, holding up iPhones to capture the moment forever. I was on my second moving sidewalk ride, taking in the energy and beauty of the tilma, when a booming voice emanated from the ceiling and started speaking in English. After 15 years or so years of visiting the Basilica this was a novel experience. I had 1. never heard English spoken at a mass at the Basilica before 2. never heard the mass broadcast over loudspeakers in the holy of holies 3. never imagined that a priest during mass at the Basilica would make a joke 4. and never imagined that he would tell us we were all going to hell. Maybe the message was only for me, because no one else seemed to hear the voice being piped in from the main pulpit from the priest, who then started to share the story again in Spanish. There are only two things to worry about in life. Either you are healthy, or you are sick. If you are healthy, there is nothing to worry about. If you are sick, there are only two things to worry about. Either you are going to get better, or you are going to die. If you are going to get better, then there is nothing to worry about. If you are going to die, there are only two things to worry about. Either you are going to heaven or you are going to hell. If you are going to heaven, there is nothing to worry about. If you are going to hell, you will be so busy shaking the hands of all your friends that there will be no time to worry. As the Virgin of Guadalupe gazed down at me, I felt she was reminding me that no matter what, it is going to be okay. I smiled to myself and heard this mantra in my head: do your best, don’t make assumptions, don’t take anything personally, and don’t worry! And that is an impeccable way to live.